It's Norris High School's turn at bat in the bottom of the final inning in regulation, the score is tied, and the bases are loaded. The batter is hit by a pitch and the home team streams out of the dugout to celebrate, the hit batsman included. As the walk-off party moves up the third base line, the visiting coach storms out to argue that the HBP-batter should be declared out for failing to touch first base and the run nullified; during this dead ball appeal, the batter-runner takes off for first base as the plate umpire prepares to rule on the play. Norris HS's Cade Argo is called out after HBP. Such a story befell Norris High School in Nebraska during a recent game against Lincoln Southeast when batter Cade Argo was hit by a pitch to seemingly force in the winning run. Replays indicate, however, that after being hit with the pitch, Argo, in the throes, of team celebration and potential injury from the hit-by-pitch, did not immediately advance toward first base, instead appearing to join with his team in celebration to the third-base side of home plate. Shortly thereafter, the visiting coach runs out to appeal Argo's failure to advance as Argo, sensing the appeal, sprints toward first base in an effort to "beat the appeal." The question, then, is, plainly, how long a plate umpire should wait for a hit batsman to complete or attempt to complete his base-running responsibility before declaring the batter out for his failure to meet this base touching obligation? As we learned back in May, NFHS (high school) Rule 9-1-1 Note 2 states, "When the winning run is scored in the last half inning of a regulation game, or in the last half of an extra inning, as the result of a base on balls, hit batter or any other play with the bases loaded which forces the runner on third base to advance, the umpire shall not declare the game over until all runners have advanced to the next base." Rules differences (OBR vs NFHS) in appeal procedure. The professional rule is similar, but, instead of requiring all runners to advance to their next base, OBR 4.09(b) considers the game over when, "the runner forced to advance from third has touched home base and the batter-runner has touched first base." EITHER WAY, how long should an umpire wait for the required runner(s) and/or batter-runner to complete their touching responsibilities? When does abandonment kick in, or, conversely, when should the defense be allowed to appeal? In a somewhat related analysis last season regarding a softball appeal play, we found that an appeal cannot be ruled upon until the player completes base-running responsibilities (again, not directly applicable because it's a softball rule). Related Post: Case Play 2017-5 - Dead Ball Missed Base Appeal [Solved] (5/4/17). For what it's worth, this is not abandonment. NFHS Rule 8-4.2p states that abandonment only applies when a runner, "after at least touching first base, leaves the baseline, obviously abandoning his effort to touch the next base." The subsequent Note supports this interpretation, "Any runner, after reaching first base, who leaves the baseline heading for the dugout or his defensive position believing that there is no further play, shall be declared out if the umpire judges the act of the runner to be considered abandoning his efforts to run the bases." Thus, we're stuck looking for an appeal in high school baseball. 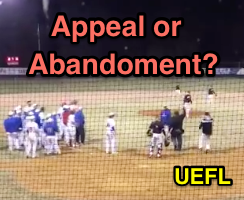 NFHS Rule 8-2 Penalty covers the dead ball appeal procedure, stating that, on the last play of the game, "an appeal can be made until the umpire(s) leave the field of play." Rule 8-2.6c states, "If the ball has gone out of play, runners must be given the opportunity to complete their base-running responsibilities before the dead-ball appeal can be made." Thus, the proper procedure here is to wait until the batter-runner (and all other runners) have had a reasonable opportunity to complete their base-running responsibilities. Because we're not looking for abandonment, we must give the batter-runner ample time to complete or attempt to touch first base, watching for potential infractions such as base coach assistance along the way. For what it's worth, NCAA Softball changed its dead ball appeal rule in the wake of the aforementioned 2017 play. 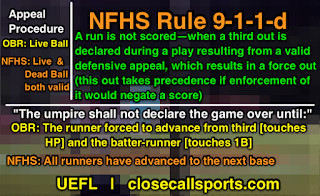 Rule 7.1.2.2.3 now states, "all runners must be given an opportunity to complete their base running responsibilities (advancing or returning), as determined by the umpire. Once a runner has been given sufficient time to advance or return and shows no immediate intention of doing so, a dead-ball appeal can be made." In softball, the runner would be permitted to correct a missed base infraction in this situation until, "she has left the field of play" (7.1.4.1). NFHS baseball has the same rule as NCAA Softball ("he has left the field of play" [8-2.6d]).